Van Gogh’s Untold Journey is based largely on Vincent van Gogh’s astonishing letters of which over 900 exist. This important work—the result of over 15 years of research—provides new insight into the artist’s true character nurtured from his abiding faith, the influence of family, and the tender solicitude he felt for mankind. William J. Havlicek’s book holds some compelling revelations, among them the role played by Johanna van Gogh-Bonger, his sister-in-law, without whom little of the inimitable Vincent would ever have been known; and the artist’s vicarious relationship with Charles Dickens. Perhaps most revealing is Havlicek’s discovery of how the inspired words of Victor Hugo, embodied in one of his characters in Les Misérables, gave Van Gogh the idea for one of his most celebrated paintings of all: The Starry Night. This particular revelation has astonished the art world. Edward J. Sexton Professor of Philosophy, Director, The Center for the Study of the Holocaust, Genocide, and Human Rights. William Havlicek has provided a clear and cogent case for the message of redemption in the work of Vincent van Gogh-—it’s a wonderful integration of the gospel message and the medium of art. Readers will find it inspiring and beautiful and Dr. Havlicek’s background in both philosophy and aesthetics comes through in this delightful book. Professor of Christian Ethics, Chair of the Department of Philosophy of Religion/Ethics, Talbot School of Theology, Biola University, La Mirada, California. The clarity of William Havlicek’s prose breaks through much of the myth and romance that have accumulated around the figure of Vincent van Gogh over the last century and cuts straight to the heart of the artist. What remains is a familial drama and a struggle with faith that were integral to the man and his work. “Van Gogh’s Untold Journey” is filled with fresh insights. Mr. Havlicek’s interpretation of the painter’s most famed work “Starry Night” is particularly stunning. Bill Havlicek has undertaken a thorough reading of the numerous letters written by and to Vincent Van Gogh. He has also examined in detail the artist’s personal life and the historical period in which he worked, drawing on the writings of historians, philosophers, art historians, literary critics and scholars of religion. The result is a complex picture of the artist and his religious and artistic ambitions. Havlicek’s analyses of a number of Van Gogh’s works, in particular “Starry Night” and “Portrait of a Peasant” are provocative. He has made fascinating connections between the paintings of Van Gogh and the writings of Victor Hugo and Charles Dickens, bringing them together in his discussion of the impact of the social gospel on Van Gogh’s thinking and artistic practice. He has also drawn intriguing conclusions about the significance of the media used by Van Gogh in creating several of his works–e.g. scenes of domestic life made using, among other things, bread, milk, eggs and olive oil. Havlicek writes with both clarity and passion. As a practicing artist he brings to his study a nuanced understanding of the mechanics of painting. He also argues that Van Gogh is a model for artists today who are seeking ways to meet their own social obligations through their art. “Van Gogh’s Untold Journey” keeps Van Gogh up close and personal. This thoughtful and sensitive study of Van Gogh through the lens of his correspondence brings to life and makes visible the ideas and passion driving the artist. 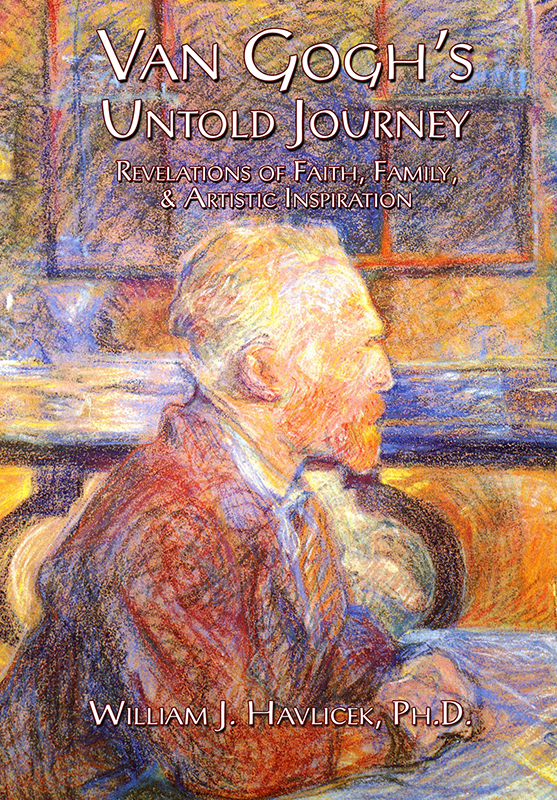 The Untold Journey is the captivating story of Van Gogh’s struggle to transform the profane into the sacred through acts of atonement in his life and his art. Associate Professor of Philosophy, Claremont Graduate University. I have long been interested in what motivates an artist like Van Gogh to create. Writing a book on Van Gogh was one way to find out. Being a painter myself was another way. In a real sense, it was through both of these ways that I found answers to my question about artistic motivations. It was a discovery that took me into the heart of human motivation itself and the wells of spiritual, cultural and natural power that feed artistic life. My personal involvement in visual art began very early with an uncle (whose birthday I shared) who gave me my first set of oil paints, along with deeply craved encouragement. It was also about the same time that one of my brother’s buddies loaned me a how to draw book. Those seeds were planted in eager soil and by high school my drawing skill was well developed. It was also in high school that a passion for writing was stimulated by teachers who sparked my desire to read well-crafted literature. My family too added a level of cultural value to all of this as my father was a Czech immigrant who brought with him rich European traditions along with my Babi’s (grandmother) cooking and peasant stories. On my mother’s side of the family was a rich gallery of ancestors including Harriet Beecher Stowe, author of Uncle Toms Cabin, and Andrew Jackson. As a child I felt that I had inherited two complementary worlds staged in the United States and Europe. My maternal grandmother had been a homesteader and nurse in Cripple Creek Colorado. Remarkably, I too would later live in Denver and obtain military medical training as a psychiatric orderly at Fitzsimmons Army Hospital. I recall a particular well-shaped reading chair that ended up in my boyhood bedroom and which became my transportation vehicle in late night reading expeditions on crackling cold Iowa winters and rain drenched spring weekends. Iowa and its lush and intense seasons would also play an important part of my love for landscape painting and was one of the things that linked my personal aesthetic with that of Van Goghs’. This landscape connection would be extended and enlarged when I lived in Holland as a Junior Year Abroad Student in art school as a student of the Minneapolis College of Art and Design. Another very important early influence was my introduction to religion as a student at a Catholic grade school and altar boy. There was a fusion of natural and supernatural thought that stimulated my childhood in ways that would later blossom into a lifelong interest in the Bible and sacred experience. These interests and motivations were also shared by Van Gogh and would be one of the strongest links that I would forge with him. The unity of the natural and spiritual aspects of Van Gogh’s life and art would become a central theme of his letters and of my book as well. The landscape is a living thing to those whose lives are dependent upon it; a lesson I would learn in the summers in Iowa when I would work as a hired hand to farmers willing to pay a high school kid a minimal wage. Later this too would be deepened when I rented a farmhouse in rural Kalona Iowa while I attended graduate school at the University of Iowa in Iowa City. Living on a gently sloping hill with a nearest neighbor a quarter of a mile away was a life changing experience. It was in that century old farm house that my vision as an artist became permanently fixed on the things of nature and that unity of nature and spiritual life took me another step closer to Van Gogh. The power, presence and intensity of the seasons were never stronger and more real to me as I had to literally dig my station wagon out of snow drifts, herd cattle, mend fence and witness animal mortality and birth—all set under the unbending power of nature. I recall one spring finding the frozen wool soaked carcass of a ewe who had drowned trying to ford a stream; a struggling victim of an unforgiving blizzard. But it was all of this combined with a stimulating masters program at the University of Iowa’s art department that helped me cement experience and ideas into a pattern of practice and exhibition. Following graduation I moved to California and began to exhibit my work and to receive much appreciated sales and encouragement. I soon had gallery affiliations with a number of well-respected Los Angeles galleries and several large-scale private commissions. By 1990 I was exhibiting in Europe and on the east coast. But Van Gogh was somehow always in the background. In 1996 I returned seriously to my scholarly roots in reading and writing as I reignited a doctoral program in philosophy with various side ventures as a museum curator and prior to that, as a full-time assistant professor of studio and art history. My doctoral program was centered on Van Gogh’s personal letters and my plan was to divide the letters into specific themes; themes that would amount to the foundation of his worldview. That world view of Van Gogh as it turned out was a rich and complex thing made up of his early memories of life in rural Brabant in the Netherlands. His letters opened onto an extraordinary vision of a life saturated with strong experiences centered on art, peasant life, seasons of change in the weather and social patterns of Europe and a passion for reading and writing. In short Van Gogh used the arts as a way of learning more about life than he could have in a relatively short life (he died at 37). Yet, his own brother Theo said that the depth of Vincent’s knowledge and wisdom was simply profound. Much of his wisdom was the product of thoughtful/reflective reading and empathy through imaginative experiences. It is this undiscovered aspect of Van Gogh that my book explores. Such things as his relationship with other artists, his deeply held moral and ethical views, his use of literature as a catalyst for his art, his profound understanding and striking nearly parallel life with that of Charles Dickens. There is also the remarkable synthesis between his painting and nursing experiences saving dying men from tragic explosions in coalmines, long treks into the night under starry skies to the bedside of a dying family friend…in short there is an unknown, adventurous, remarkable, compassionate man who seems to have been lost in the dramatic stories surrounding his illness and early death. My effort is to resurrect an unknown aspect of Van Gogh—one that is even heroic and certainly praiseworthy and profoundly religious in the best sense of the word. Dr. William Havlicek, seen above with his wife Jeanne, has over 30 years of experience in college teaching, museum administration, publishing and fine art/studio production and exhibition. He holds a Ph.D. from Claremont Graduate University and is a graduate of the University of Iowa with both Masters of Arts and Masters of Fine Arts Degrees. He currently teaches at the Laguna College of Art and Design, in Laguna Beach, California.